If you’ve been victimized by credit card fraud or identity theft, the IRS’s advice is to place a “fraud alert” or a “credit freeze” on your credit account. You can also use a credit monitoring or identity-theft-repair service, and you can choose credit cards that provide extra protection from fraudulent losses. The first step you need to take, however, is to notify your credit issuer. 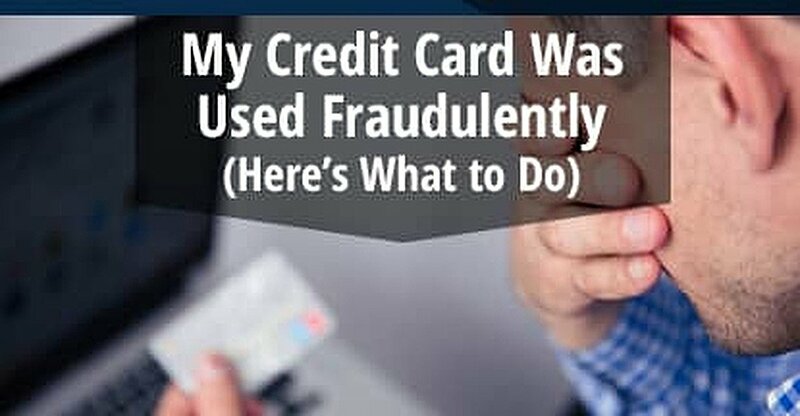 Upon learning of the fraud, immediately contact the card issuer, who will cancel and replace your card, thereby stopping any further fraudulent use. Once contacted in a timely fashion, the card issuer will absolve you of liability for any further use of the card. Federal law limits your liability to $50 if you report the fraud within two business days after it comes to your attention. The maximum liability increases to $500 if you wait longer than two business days to make the report. If you delay 60 days without speaking to the card issuer, you may be responsible for all fraudulent losses. Note: When you receive your replacement card, don’t forget to update the account number at all the places that use your credit card for auto-pay arrangements. Requesting a fraud alert is critically important in order to limit further damage after your credit card was used fraudulently. A fraud alert makes it harder for the fraudsters to create new bank or credit card accounts under your identity. Once in place, a fraud alert will red-flag your account to credit issuers, including gas stations and department stores, warning them to request supplementary proof of identity. If you become a victim of fraud or identity theft, immediately call one of the three bureaus and also order free copies of your credit reports. You only need to call one of the credit bureaus for a fraud alert, as that bureau will automatically alert the other two. Initial: Protects unverified persons from accessing your credit for 90 days or more. Although an initial fraud alert lasts only three months, you can renew it if you so wish. This is a prudent safeguard if you misplace your wallet containing identifying financial and personal information, credit/debit cards, your Medicare or Social Security card, etc. Active Military Duty: Available to protect active-duty military personnel for one year following deployment, an Active Duty Alert means businesses must take extra security measures prior to granting credit in your name. If you need extra protection because your card was defrauded or your identity was stolen, you can request a credit freeze instead of a fraud alert. The freeze allows you to curb access to your credit reports, which helps prevent fraudsters from discovering your other accounts and credit cards. You have to request a separate credit freeze from each of the three credit bureaus, and you may have to pay fees. Each bureau will provide you with a password or PIN that you can later use to terminate the credit freeze. These services will inform you of and/or confirm new credit activity – anything from the opening and use of credit cards to changes in your credit scores to requests for address changes. TransUnion offers credit monitoring for all three bureaus; they will also grant you access to your TransUnion credit score, report, and email alerts to any changes to your report. Try it for one week for just $1, and continue services thereafter for the low cost of $16.95/month. No one can prevent identity theft, but firms offering identity theft protection pledge to take whatever steps are necessary, up to some financial limit (usually $1 million), to correct the problem. Identity Theft Protection will monitor your credit, help you replace the contents of your wallet (credit cards, insurance cards, etc. ), make corrections to your creditors and the credit bureaus, and will even provide lawyers if you need them. Some credit cards are safer than others, in that they provide fraud protection coverage beyond the federal limits. Look for cards that offer zero liability for credit and debit cards, and ATM transaction protection better or equal to the federal limits. Four excellent candidates are the cards from American Express, Discover, MasterCard and Visa. The latter two offer full protection for debit PIN card transactions.